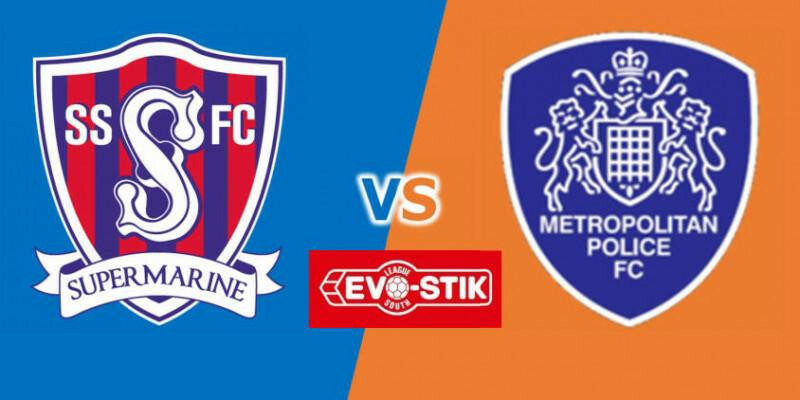 Swindon Supermarine will be taking no prisoners as they hope to make it three wins in a row when they take on second in the table Metropolitan Police at The Webbswood Stadium this Saturday, writes Nick Taylor. After wins at home to Walton Casuals and away to Kings Langley, Lee Spalding’s side will line-up against opponents who have surprised many this season. Having reached the first round proper of the FA Cup before losing 2-0 at home to Newport County, they have continued to achieve impressive results against more fancied teams with larger budgets. The latest being a dominant 3-1 away win at Taunton Town last weekend. Met Police Manager Gavin McPherson has gathered together a squad of young, eager talented players who cemented their playoff place last Saturday and sit one point above third placed Taunton Town, although seven points off of champions-elect Weymouth. They will be seeking revenge in Wiltshire after Marine scored a 2-0 success at their historic Imber Court ground back last August, this being the only away side to record a league win at their ground this season so far thanks to strikes from Conor McDonagh and Stuart Fleetwood. Since then, both sides have seen transformations and only a few players from both squads now remain from that day in August, only five of Marine’s players remain in the squad that faced Kings Langley last week. Saturday’s encounter brings together two of the league’s top striking partnerships, Marine’s McDonagh with 24 goals and Fleetwood with 12 goals) will be looking to out gun Jack Mazzone 22 goals and Max Blackmore’s 20 goals from the Met Police. Both teams like to get the ball down on the ground and play the passing game, so the good surface of the Webbswood Stadium, as practised upon by the Spanish Women’s National Squad on Monday, will also suit our visitors. Although with five of their six losses this season being away from home Marine approach the game in confident mood. Connor Thompson is again unavailable for Marine due to injury and holiday commitments but goalkeeper Martin Horsell has completed his four match suspension and returns to the squad. Otherwise, before training on Thursday evening Marine should be at at full strength.